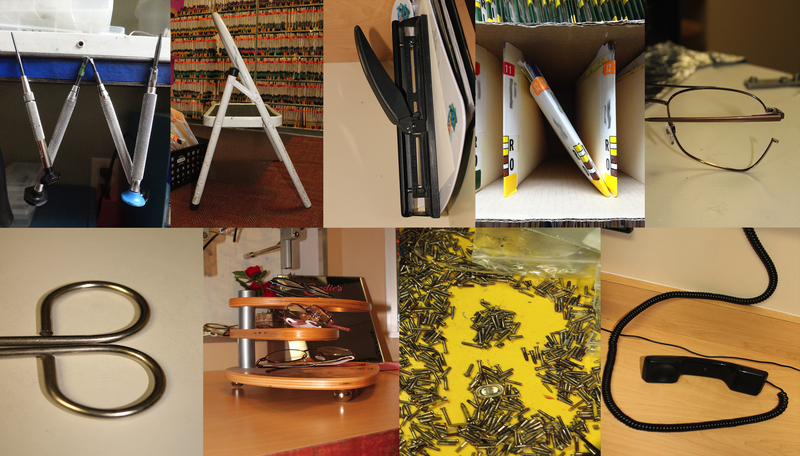 Wayne Berg spells out his name using every day objects found throughout the workplace. Given the task of spelling his name using only objects found in the world around him, Wayne stumbled upon several workplace items that did the trick. As an Optician (a trade assumed during his college studies), Wayne is accustomed to working with tools such as small screws, screwdrivers, and pliers to preform repairs and maintenance on eyeglass frames. Additionally, the use of patient records and telephone communication between patients and other offices requires these items regularly. Viewed from a particular angle, it’s easy to see a subliminal spelling of WAYNE BERG throughout this Optometrist’s office.